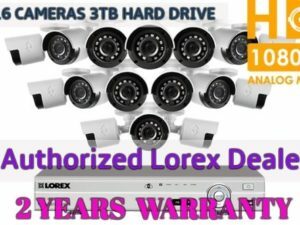 View cart “New Lorex 8 Channel 8 Metal Outdoor Camera 4MP 2K HD Security System 2TB DVR” has been added to your cart. Welcome to the next generation of home security monitoring. Lorex has taken its 20 plus years of experience in this industry and developed a wire-free security solution built for you. This system is ideal for those who take their security seriously but wish to avoid long distance cabling. It includes four battery operated wire-free security cameras, a wireless receiver, and a security grade Digital Video Recorder (DVR) with 1 terabyte of available storage. 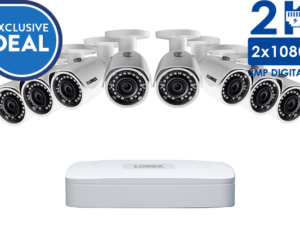 Wire-free camera features include full 1080p HD recording resolution, crisp infrared night vision, advanced motion detection and weather resistant housings to ensure the highest level of wire-free security available. There is also no hidden fees or monthly subscriptions moving forward with this Lorex wire-free security system. Welcome to the next generation of home security monitoring. Lorex has taken its 20 plus years of experience in this industry and developed a wire-free security solution built for you. This system is ideal for those who take their security seriously but wish to avoid long distance cabling. It includes six wire-free security cameras, six rechargeable battery packs, wireless receiver, and a security grade Digital Video Recorder (DVR) with 1 terabyte of available storage. Wire-free camera features include full 1080p HD recording resolution, crisp infrared night vision, advanced motion detection and weather resistant housings to ensure the highest level of wire-free security available. There is also no hidden fees or monthly subscriptions moving forward with this Lorex wire-free security system. *Wire-free cameras will already be paired to your DVR. If this is not the case, please follow the directions in the included Quick Connection Guide. Wire-free cameras include a powerful and long lasting battery Power Pack. With these two-cell rechargeable lithium-ion batteries, you can expect up to four months of use before having to recharge them. * The ultimate life of your battery will depend on the usage of the camera. If it is in a high traffic area, the battery life will be shorter. Don’t worry, though, you can always check the battery life through the Lorex Secure app. You will also receive low battery notifications through the app as well. Another important feature is the Power Pack’s convenient quick-release function, which allows for easy battery replacement without having to remove the camera from its mount. How many motion events can be captured on a single charge? There’s no need to worry about constantly changing your wire-free batteries! Each battery Power Pack will provide you with approximately 168 motion recording clips per week for up to 17 weeks on a single charge! *Figures above are just an example approximation based on 4 minutes of motion recording per day. Actual results will differ depending on user configuration and settings. Wire-free security cameras only record when motion is detected. When a camera detects motion, it will automatically wake up and start recording. It will then keep recording for a customizable period of time before returning to standby mode. 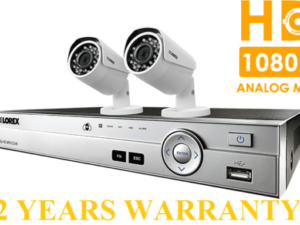 A professional grade Digital Video Recorder (DVR) is included with this wire-free security camera system. Within this DVR is a massive 1 terabyte (TB) security certified hard drive. This amount of storage space will provide you with up to two years of motion recordings. Local storage also means that your security footage is always with you and not in a cloud. Upgrade the 1TB hard drive within the DVR to a 6TB hard drive. This amount of storage space will pretty much keep your video data virtually forever. Please refer to the DVR manual for hard drive installation instructions. Record on all channels, view live video, playback recorded events, back up recorded footage, and remotely access your system all at the same time. This is thanks to your DVR’s powerful pentaplex operation capabilities. With full 1080p HD recording and wide 88° angle lenses, wire-free cameras from Lorex will deliver clear details and accurate representations of important events. These wide angle lenses, in comparison to wider angle lenses that stretch the field of view, will precisely represent real-life with an undistorted image. The ultimate purpose of a security camera is to capture useful evidence should an incident occur on your property. This is why it is so important to have full 1080p HD quality security footage. It may end up being the difference you need when identifying vital details such as facial features or license plate numbers. A Passive Infrared (PIR) sensor below the lens of the camera detects heat from moving objects such as people, animals, or vehicles. This sensor does not work through glass, however, so it is NOT recommended to install wire-free security cameras indoors facing a window. For best results, position the camera around 20ft (6m) away from the area you wish to monitor. If possible, you should also try to position the camera so that objects of interest will move from side-to-side across the camera’s field of view, rather than moving towards or away from the camera. Having a security camera that can keep a watchful eye on your property during the night is vital to anyone who takes their security seriously. Thankfully, Lorex wire-free cameras include 12 powerful infrared LEDs, which will provide you with night vision up to 40 feet away with ambient light or 26ft in total darkness. These cameras also feature an automatic infrared cut filter that will automatically disengage at night. This ensures that the infrared lights will have no effect on the colors within the video during daytime scenes. Lorex wire-free security cameras are weather resistant and can continue to operate through both rain and snow. They will even continue to operate in temperatures as low as -4°F and as high as 104°F. For an extra level of protection and to keep the lens clean, you may want to choose sheltered locations for your cameras. Our free Lorex Secure app for your mobile phone or tablet will allow you to securely access your wire-free cameras from virtually anywhere in the world. This app is seriously powerful, and is full of convenient features that make monitoring your home easier than ever before. All motion events will be listed for you to easily view recorded videos saved on your recorder’s hard drive. Your wire-free system doesn’t require you to upload any video data to the cloud. This means that it will not effect your internet bandwidth usage. In fact, the only time you will need to tap into your internet bandwidth is if you need to access your security system remotely (i.e. live viewing or playback) via the Lorex Secure app. 1. 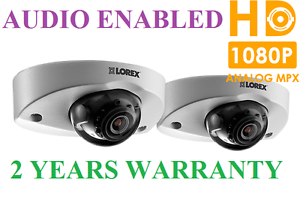 Compatible with Lorex 1080p & 720p HD wire-free cameras. Cameras sold separately. For a list of compatible cameras, please visit /support. 2. Requires a high speed Internet connection and a router (not included). An upload speed of 3Mbps is recommended for the best video performance. Up to 3 devices may connect to the system at the same time. For the latest compatibility list check as new models become available in the market. 3. Both firmware and software must be updated to latest version to ensure remote connectivity. Firmware updates are pushed to the DVR automatically over the Internet. Always update to the latest software (available at ) after upgrading the DVR firmware. Don’t pay a professional. Cameras are easy to install by yourself. 1. Maximum wireless transmission range. Actual range dependent upon building materials and other obstructions in the path of the wireless signal. 2. Battery life is based on ideal conditions and will vary depending on settings, usage, and temperature. 3. 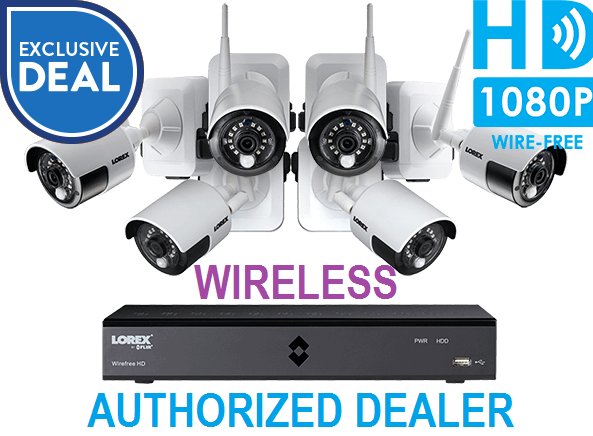 HD Wire-Free cameras are compatible with select Lorex HD Wire-Free DVR recorders. For a full list of compatible recorders, visit . 5. Not intended for submersion in water. All trademarks belong to their respective owners. No claim is made to the exclusive right to use the trademarks listed, other than the trademarks owned by Lorex Corporation. We reserve the right to change models, configurations or specifications without notice or liability. Product may not be exactly as shown.